We service all makes and types of vehicles both petrol and diesel. We only use top quality semi and fully synthetic oils as this is the life blood of modern engines. We have daily deliveries from most of the main motor manufacturers and motor factors, so any additional parts required can be ordered and normally delivered the same day. Servicing of newer vehicles still under manufacturer's warranty is not a problem as we service to the correct schedule and use genuines (OE) parts to ensure that your warranty is fully protected. 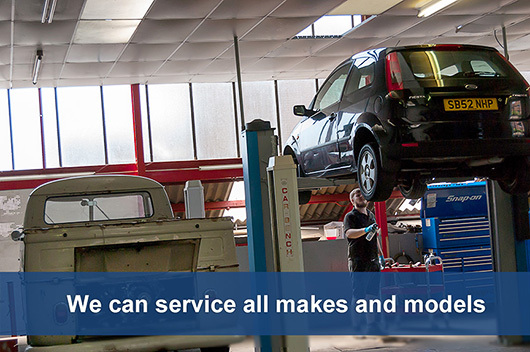 When you book your car in for a service, we can take you home and collect you when the service has been completed. Alternatively, we can offer you a free courtesy car for the day. Electric and Hybrid car servicing and repairs are now available. We are proud members of HEVRA an organisation set up to support mechanics who service and repair enviorenmentaly friendly vehicles.